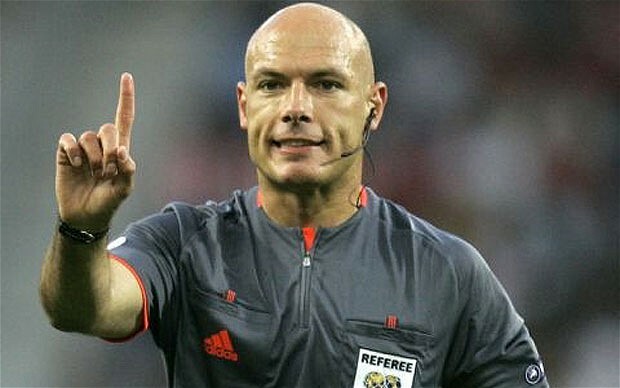 Webb and Clattenburg can’t defend themselves publicly, because referees aren’t allowed to speak to the press. That’s part of the reason so much attention is paid to autobiographies like Mark Halsey’s Added Time, which contains a full account of the Clattenburg-Mikel incident, and Graham Poll’s Seeing Red, which struggles manfully to make the third yellow incident seem like something less than a career-defining calamity. After Liverpool’s 2-1 loss to Manchester City, Brendan Rodgers questioned referee Lee Mason’s integrity, and fans tweeted about everything from Mason’s Mancunian roots to his baldness and his weight. But Mason himself didn’t say a word. Referees should be required to give post-match press conferences. Players and managers give them all the time, and they’re often asked to comment on the referee’s performance. Referees should comment on their own performances. They should apologize for mistakes and complain when they feel unjustly persecuted. In Added Time, Halsey claims that he asked Sir Alex Ferguson to publicly support Clattenburg, partly because Clattenburg wasn’t permitted to publicly support himself. Referees should not have to beg Sir Alex for help. Moreover, referees are uniquely positioned to explain controversial calls: they fully understand the Laws of the Game, and they’re privy to the mysterious FIFA directives that supposedly govern “gray-area” decisions involving things like penalty-area grappling and tackles from behind. Since pundits still can’t agree about the penalty calls in the Liverpool-Chelsea game, wouldn’t it be interesting to hear Webb’s interpretation of, say, Lucas’ tackle on Hazard? It would be interesting, but we’re probably never going to hear it – unless, of course, Webb decides to put it in his memoir. Reblogged this on Play the Advantage. Good point. What frustrates me is how easy it would be to fix this. Just stick a microphone in front of the ref as he leaves the field! You raise a great point but it adds an additional requirement of a referee being able to be a quick thinker and a good talker because a great decision could be poorly explained by a ref nervous in front of the camera. I like the underlying point of a lack of defence. That’s true, but we hold coaches and players to that standard. Why shouldn’t referees have to explain themselves, too? Actually, I’ve seen several interviews that Nicola Rizzoli has given where he explained his reasoning. It was always a few days after the match, and in a controlled environment (no microphones in his face or shouted questions), but he was frank and honest. Granted, Rizzoli is whip smart and super well spoken, but I always felt that it was a good precedent. It would be nice to allow them to explain decisions, perhaps in a controlled environment after the game. This would give them a little time to gather themselves before having to answer questions in front of a journalists. Would at least give them a platform to answer serious accusations and explain their decisions as a defence against managers that often use the refereeing decisions to divert attention from the team having a bad game.